"Today we formed a committee....", my wife was telling me. Now this was not news to me because only a month ago the women of our society had formed a committee that collapsed like a government propped with an outside support. I almost jumped out my chair when I heard her coolly saying. '.... to adopt the roads.' This was something strange. I knew of all adoptions but I had never heard of anything like this. 'We have decided to adopt the roads, my wife continued without giving me chance to interrupt, of our area.' I could not hide my surprise but at least the cause looked innovative. Why, perhaps, it was the most innovative of them all. 'You know I am the president. Actually it was a photo finish between Mrs. More and me. I won by a solitary point. All wanted me to win. No body likes Mrs. More you know.' The breathless dialogue did not miss the tinge of sarcasm. My wife had seen me talking and helping Mrs. More drive away lizards from her kitchen couple of times. What surprised me that how could Mrs. More not liked by anyone could still finish a close second. I did not voice my opinion and wisely so. 'So then what's the exact agenda? Which is the area and which are the roads and what are you thinking to do to them?' It was a feeble attempt to imitate her. Paying not much attention to my questionnaire she said, " Actually, you know it's an 'adopt a road' cleanliness drive." She pulled a paper from printer tray and took my roller pen to demonstrate her (their) plan. She started speaking as she drew a map of the area. "We are focusing on this area. All the incoming and outgoing roads at this junction (Here she went on circling and circling so much that I started worrying for my phoren roller pen) are our targets. I mean we have adopted all these roads for cleaning!" "For cleaning!" I could not hide my surprise and apprehension. "Naturally..........." my wife roared. After all she was the latest example of fairly elected president without any rigging you see. The single vote margin was an ample proof of the honesty. "But then whatever happened to Mumbai police? They were supposed to monitor this job. That is what the Commissioner of Police had declared with a lot of confidence that normally is conspicuous by its absence." "Failed. Failed miserably." she thundered banging my precious pen. "You too could end up that way." I calmly took back my made-in France roller pen. "No way Sir, no way. We know exactly what to do." She sounded confident. "How?" I asked. "We are lucky (and I always maintain that) to have a successfully planned but miserably failed (executed) scheme in front of us to guide. You see, we can learn a lot from others' mistakes." I could not but agree. "As a president I have formed a tree organization -apex at the top and base at the...she suddenly stopped and like a consummate politician unflinchingly continued... bottom. "We have selfless volunteers who unlike the constables are willing to catch the culprits and fine them." "But who has defined the crime?" I asked. "You know, she said, Mrs. More's aunt's son-in law is a sub-inspector. He was present in the meeting of that flopped scheme." "So?" I appreciated my wife's intelligence. "He had a Xerox copy of the Commissioner's circular that has clearly defined the offences like throwing garbage, spitting, cooking or washing clothes on the road side apart from teasing the eves, pick pocketing, pimping molesting and encroachments of all sorts. Now we all have Xerox of that original Xerox of the circular." For the next few days, my house looked like one of a politician: constantly ringing phones, lot of arguments, empty cups and mugs, lot of crumpled biscuit wrappers, waste paper balls and a heap of fashionable foot wares behind the front door. In no time my bedroom got transformed into a makeshift green room. In short I had surrendered my house to the maiden invasion. My wife was very happy at the turn of the events. She was smiling all the times. Her only grudge was Mrs. More's inevitable presence to all the meetings. But being the president she hid the grudge and kind of carried herself very well. So far so good. I had to leave for an out station engagement for a week. So excusing profusely to the group for the future inconvenience, if any, and wishing them every success in their unique endeavour, I took leave of them for seven days. Next week, I entered my area hoping that it could be the cleanest one. But the whole area was as it was before; rather on a dirtier side. I entered house with little nervousness. My wife greeted me but her movements suggested that she had a story for me. "Everything went according to the plan, she started cautiously, meticulous care was taken, all the aspects were considered reconsidered, lots were drawn to eliminate the factor of luck and then only the roads were allotted." "Wisely executed," I said. "Yes, so far soooooo good was it." "What do you mean 'was it'?" "Being president of the committee I had sent a nice letter to the local police station explaining the cause and its subsequent repercussions. I did not forget to forward a copy of that letter to the Commissioner of Police, Mumbai to provide us with the protection and support if needed." "Superb, just superb. It could not have been better." I really appreciated my wife. "But, where did the fly sneeze then?" "In the evening as we all were working out the details, a handsome inspector with a constable came asking for me. He gave me two letters. One was police commissioner's letter addressed to me and the Inspector of our area police station." "What did it say?" I was curious. "At the outset he thanked me-I mean us-profusely for the cause but expressed his department's inability to let us do the job that we had undertaken. He saluted me and went." "And who had written the second letter?" I smelled a rat now. 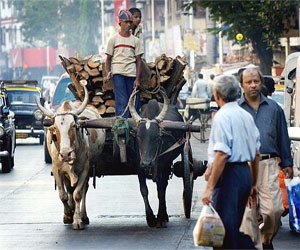 "It was from the Commissioner of Mumbai Municipality to the Commissioner of Mumbai Police. It was a curt note. The former Commissioner warned his counterpart not to stick his nose too deep into the affairs of others lest it got snubbed." Getting the impetus from the episode I said, " that precisely had happened to the police department when they tried to do BMC's job. They very well could have got the job done rather than trying to do themselves. That is why my dear, I have been telling you not to..." cutting me short she said, " My dear neither you are from the Police nor am I from the Corporation."